Here is a thing everyone wants: A miracle. Here is a thing everyone fears: What it takes to get one. Any visitor to Bicho Raro, Colorado, is likely to find a landscape of dark saints, forbidden love, scientific dreams, miracle mad owls, estranged affections, one or two orphans and a sky full of watchful desert stars. At the heart of this place you will find the Soria family, who all have the ability to perform unusual miracles. And at the heart of this family are three cousins longing to change its future: Beatriz, the girl without feelings, who wants only to be free to examine her thoughts; Daniel, the Saint of Bicho Raro, who performs miracles for everyone but himself; and Joaquin, who spends his nights running a renegade radio station under the name Diablo Diablo. They are all looking for a miracle. But the miracles of Bicho Raro are never quite what you expect. Loved this book from start to finish. Stiefvater was at her best with her prose here and the novel was lovely and atmospheric. "All the Crooked Saints" is YA fiction with a heavy dose of magical realism. The Soria family lives in Bicho Raro, Colorado, where they are saints who perform miracles. The process of the miracle is perhaps not what you would expect. They pull a part of the person out (their demons which manifest as a challenge) and then the person must overcome them. These pilgrims stay in Bicho Raro while doing so, but the Sorias cannot speak to them during the process- if they interfere, they will also be cursed. The book follows some of the Sorias, the pilgrims, and others who are related to the town. The book almost reads like a bunch of related short stories, telling us about many of the people rather than focusing on a few main characters. The book was not what I expected. While it has the lyrical prose of the talented Stiefvater, it doesn't follow the same clear plot as the other series (which is not to say that it doesn't tell a story). It's beautiful in the way it is written, but as the characters' stories are only somewhat intertwined, you don't get the same overall focus to the novel as the past books did. I have some mixed feelings about it as a result. While it is beautifully written, it didn't capture my attention the way her past books did. However, I still enjoyed it as it tells some really unique and elegant stories focusing on many different characters (although a few do keep popping up). The prose felt very similar to the Raven Boys series in its beauty and musical quality. Fans of magical realism will really enjoy this new novel. Trust me when I say no one was more stunned than me when I enjoyed All the Crooked Saints. 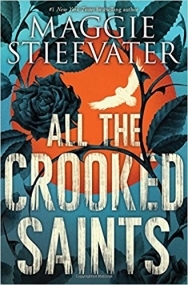 All the Crooked Saints is very different from Stiefvater’s usual work. The storyline was so fascinating; the blurb is quite vague and doesn’t explain much, but that is most definitely a positive for the book. The novel is set in a Colorado desert where the Soria family runs a ranch, but their main business is performing miracles on people (pilgrims) who are stuck or depressed with life or who are trying to run away from their lives. The only problem is that once the miracle is performed, it exposes your inner darkness into corporeal form, and the only way for the darkness to disappear is for you to understand the darkness – once that happens, the second miracle takes place and you are healed. It’s a magical realism novel, so the magic is intertwined with reality which casts a creepy tone throughout the entire book. The characters were the stars of the novel. From the entire Soria family, to the pilgrims, to Pete (who is the best guy ever and deserves to be protected) … everyone was fantastic. Stiefvater has always had great skill with characterisation, but she really outdid herself with All the Crooked Saints. While there are a lot of POV characters – as the narrator is omnipresent – the four main characters are Beatriz, Daniel, Joaquin, and Pete. Beatriz, Daniel and Joaquin are cousins – Beatriz is the girl with no emotions, Daniel is the Saint, and Joaquin is an amateur DJ, while Pete is just in Bicho Raro looking for a truck. Their stories all intertwine in clever ways, and I loved reading them interact and watching their stories evolve. All the Crooked Saints has a large cast of characters and each of them were different and unique. Stiefvater also took the time to delve into all of the characters’ background stories, making them an integral part of the story. On my blog, it's no secret that I have a love/hate relationship with Stiefvater’s writing. I found it very original in the first few Raven Cycle books, but by the time the last book came along, I was exasperated. In All the Crooked Saints, much of the prose was lyrical and quite beautiful. But it was also peppered with a few lines and metaphors that irked me a little. It was half rambling, half alluring. Stiefvater is definitely an author whose writing you either love or hate, but I admit that she’s slowly growing on me. I was pleasantly surprised by my enjoyment of this novel. While there were bits and pieces that felt awkward and like Stiefvater was trying too hard, for the most part I really liked this book. However, I also think my enjoyment of this book is because I went in with very, very low expectations – like the lowest of the low. But, All the Crooked Saints has honestly rekindled my love of Stiefvater’s books. I’m really looking forward to her expansion into The Raven Cycle through a trilogy about Ronan, and I can’t wait to read #girlnovel and #foolishnovel.